We have a lot of fears. Some make sense; others, not so much. This latter type will be featured once monthly until we run out of material, at which point, we might begin accepting the fears of our readers. I’m often afraid that I’ll get trapped inside of my clothing and never be able to escape. Don’t think about it too much or you’ll feel your outfit start to tighten around you, clenching. 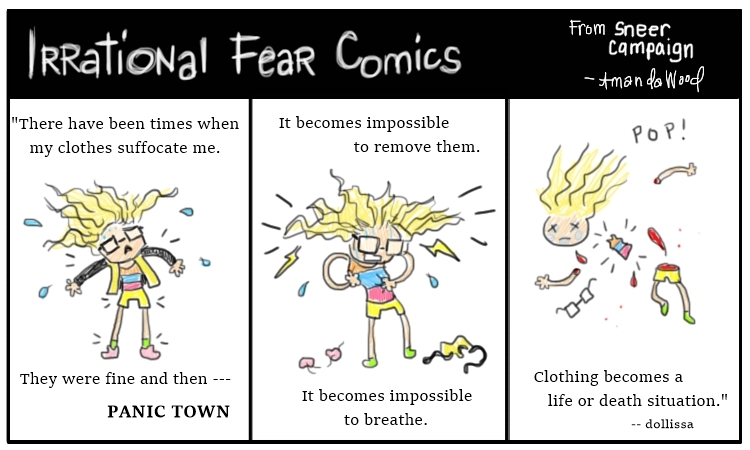 I don’t know where this fear originates, but it’s incredibly stressful, especially if I’m already anxious. More than once, I have resorted to desperate measures to get myself out of tighter-than-expected clothing that I felt claustrophobic in. The items that I was wearing were not necessarily tighter than others, but it sure felt like it on those fateful days. We’ll never know if the dress that I cut off, the shirt I ripped completely apart, or the pants that I broke the zipper on would have otherwise kept me trapped forever, gripping my skin until my anguished, dying breath which would be very shortly after… because this is one of the worst things I can possibly imagine. And don’t even get me started on socks.